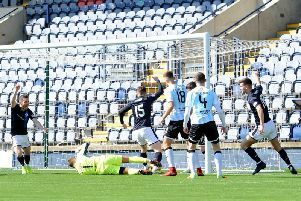 Robbie Thomson is hoping performances like the one in Airdrie on Saturday will help him retain the number one jersey with Raith Rovers. Thomson made three terrific stops, one before half-time to prevent Rovers falling 2-0 behind, and two deep into injury-time to ensure Rovers claimed a point. While disappointed with the result, which allowed Arbroath to extend their lead back to 13 points, Thomson was pleased to make a telling contribution. “That’s my job at the end of the day, I need to be ready to make a save,” he said. “I take pride in that, and I work really hard in training to make sure I’m ready to help the team. “Whether it’s communication, my starting position, I’m always trying to be ready. “Making saves has always been a strength of mine, but as a keeper you need the full round package and that’s what I try to work on all the time. “Shot-stopping is your bread and butter. I’ve played under managers before who almost write shot-stopping off, saying ‘you’re a goalie, you’re meant to do that’. Thomson’s heroics were a timely reminder of his capabilities as Rovers completed the signing of former England youth goalkeeper Dean Lyness this week. “It’s a position where you’re always guaranteed competition,” Thomson said. “It’s something you need to put up with, and work with each other at the same time, but I came here to play, and I want to be part of something moving forward. “I’ve built up that experience now to be a trustworthy number one for the club. “I’ve managed to play regularly, which has been good, but my other reason for coming here was to try to be successful and get promoted. “There’s still a lot to do to realise that goal. “It’s been tough, it’s a challenging league, so we just need to try to keep going the best we can, and work each week to keep winning. Aged 25, Thomson has racked up almost 150 appearances in senior football, and feels his game is constantly improving the more first team action he gets. “Week in, week out I’m getting more and more experienced,” he said. “I think I’m over the tag of being a young goalkeeper now, and I’ve had a good stint in terms of games, if you look at my career so far. “Hopefully I can just keep kicking on and being an important part of something moving forward.